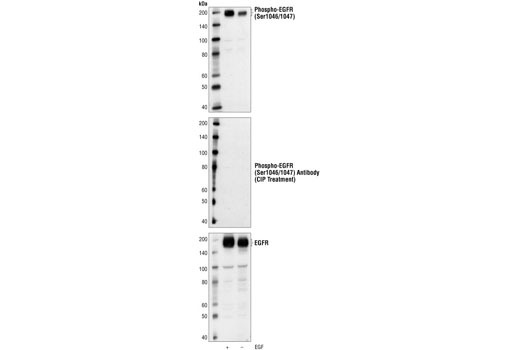 Western blot analysis of extracts from A431 cells, untreated or stimulated with EGF (100 ng/ml, 10 min), using Phospho-EGF Receptor (Ser1046/1047) Antibody (upper) or EGF Antibody #2232 (lower). Calf intestinal phosphatase (CIP) treatment abolished the immunoreactivity of Phospho-EGF Receptor (Ser1046/1047) Antibody with EGF-stimulated A431 cell lysates (middle). Phospho-EGF Receptor (Ser1046/1047) Antibody detects endogenous levels of EGF receptors only when phosphorylated at Ser1046/1047. This antibody may cross-react with other activated EGF receptor family members (e.g. ErbB2). Polyclonal antibodies are produced by immunizing animals with a synthetic phosphopeptide corresponding to residues surrounding Ser1046/1047 of human EGF receptor. Antibodies are purified by protein A and peptide affinity chromatography.